This could actually be used one of two ways. 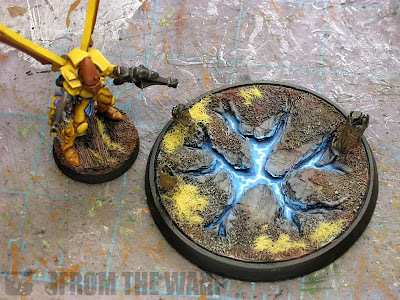 I think it'd make for a great Dark Eldar webway portal or maybe an even better basing theme for a daemon army. If not a whole army, then a character model for sure. Dark Eldar use webway portals with great precision. Representing them on the tabletop is not always as precise. A while ago, I came up with the idea to use half of a plastic Wiffle ball to get something close to the GW version. 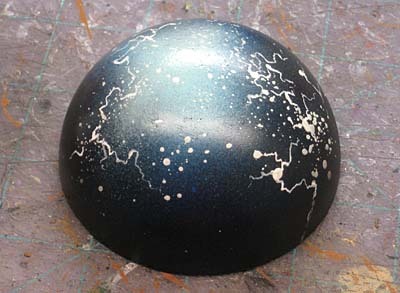 My first attempt there looks more like the GW version being a half sphere with cool lightning effects and such on it. It works, but it may not be what you're looking for in your Dark Eldar force. It does work wonderfully for a Vortex grenade though. This time, after seeing this post over at joesavestheday where he talks about a crazy lighted plamsa marker he found at Adepticon, I decided to try my hand at recreating something along the same lines. Actually, it's not even close, I just needed an excuse to try to make this thing. I figured I could make something similar with a 60mm base, some greenstuff and some creative OSL painting. Lots of creative painting. Building it is not as tough as it might look. The key is the blank base that creates an area for you to work inside of. I don't know as that I would try this on top of a normal base. The hollow blanks allow you to get that recessed look much easier than trying to do all of this on top of a regular base. That and the nice clean edge gives the base a finished look in the end which gives it some street credibility. Here's what it looked like before paint. The first step is to collect a few pieces of your chipped bark and arrange them in the center of the base so that you create what looks like a series of cracks in the ground. The closer you are to the middle of the base, the larger the cracks can be. By the time the crack reaches the edge of the base it has all but closed back up. This gives it the illusion of having just started to open up underneath you. Once you have your bark pieces arranged, take the pieces off and set them aside in the same positions so you can glue them back onto the base one by one in the same configuration. Once this dries, take some extra greenstuff and fill in around all the outer edges of your base. It doesn't have to be perfect either, you're going to cover it with sand and such. Now is when you add things like stumps, skulls and debris to match your existing basing theme. Once you get all the greenstuff in place, take your sculpting tool and cut the outer portions of the cracks in where you want them. You can see it's just the outer portions of the base that are done with the greenstuff. 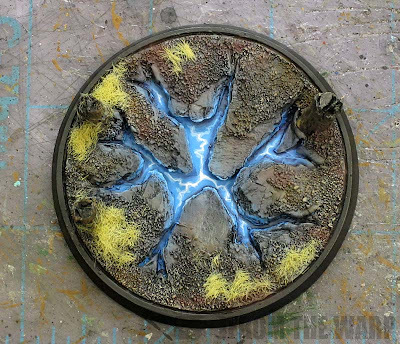 Once that has had time to cure, cover it with whatever basing material you used on your army already. I started by priming the whole thing black. The first thing you need to paint is the underground or cracked open portion. I started by using a light blue color and painted the bottom of the base in the cracked area. Don't worry if you get it on the rocks... in fact you want to get it on all of the inside edges of the rocks. That will help you create the lighted look. Once you have your light color down, give it a wash of a similar color. In this case it was blue as well. I'm not giving the exact colors because you could do this with any color you want really, reds, greens, purples... I just chose blue for this example. Once your wash is dry, go back and drybrush the inside edges of your rocks and try to catch the edges to show that they are being lit from below. Once your drybrush is done, go back with your original base color (light blue) and repaint the centers of the cracked areas to clean them up. This step is repeated two more times. Each time, add a little bit of white to get a slightly lighter tint and don't go as far out. The last pass should be with pure white and in the very centers of the cracks. I made mine look more like lightning instead of lava in this case. I used small angular lines instead of a series of broken shapes like lava would have. You can use whatever effect you like best. Once you have the inner portions painted, then you can move onto the ground level stuff. If you try to paint the ground first and then the interior cracked portion, it will be much harder. The ground is nothing more than two heavy drybrushes. The first pass is with a grey color that is done near the cracked openings. The second pass is with a dark brown and it is applied along the outer edges. The static grass is there for some contrast, but not necessary. 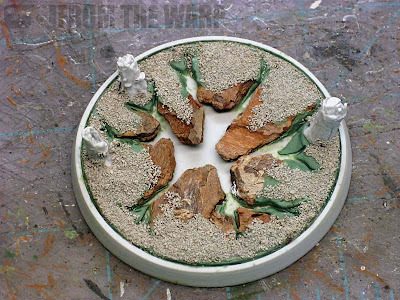 In reality, you want to finish the ground level portion of the base to match your existing base theme for your army. 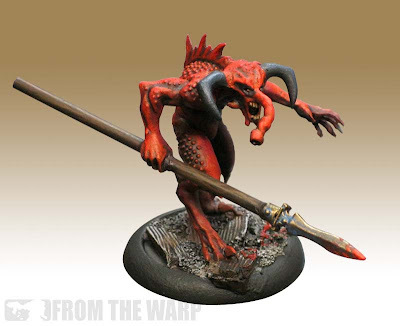 I know daemons just got a new wave of models released and lots of folks set their daemons on lava type bases to give them a certain look and feel. Kind of like the end of the world and it's tearing apart. It's very fitting for the army and the background associated with them. If you picked up enough blanks and had the chipped bark available, you could make a killer looking themed army using this approach. You could have the ground cracking open underneath them making it look as though the earth were tearing apart as they charge across the battlefield. And you could use any color in the cracked areas as well. Want to make it look like blue or purple lightning? No problem. It might be a bit more work, but it would certainly make your army (or main character) stand out on the table. What if I paint my bases first instead of last? That there is a very nice base! Very cool, sir. I hope that your still recovering well from the storm and that your home will be back to normal soon. Krisken: Thanks! I really want to try it as a daemon basing theme more than I want to use it for a webway even though that was it's original purpose. Feldmarshal Goehring: No problem. Recovery is going well, we're looking to get a good portion of the inside work done this week. At least enough so that it doesn't look like a war zone. The base looks good, but I've always pictured the webway portal as more of a raised portal rather than a flat section of ground(Don't really like GWs wiffle ball interpretation either). Definitely see this as a great demon base though. Don't want to veer too much off in the comment, but I notice the corsair eldar there. I'm been considering getting the kit from FW, but they don't list the actual contents of the kit. Does it have enough to make a full set of CC corsairs, or is it 5 CC, 5 Las rifles? Bill: The more I look at it, the more I think it would do better as a basing theme. Don't worry about getting off topic. The Corsair there is scratchbuilt. I have no idea what comes in the Forge World kit to be honest. Base looks sweet, also like the idea using the wiffle ball. Imaginos: Thanks, the wiffle ball is perfect if you like the half dome look to the gateway. Corsair kit has enough to build ten corsairs, and includes bits for a squad leader with a variety of pistols. Love it. Great tutorial. There are lots of ways to utilize the technique and its definitely a great way to represent a portal. The new portal / base looks awesome! Great job and thanks for the tutorial! Joe: I'm not sure that mine look better or not, I was just taking some inspiration from what you had. I appreciate you sharing what you discovered. I did something similar to this for my necrons. What would you suggest I do to make my bases look a little bit more like lava, and not just orange and yellow paint? Hivetyrant36: Thanks for the comment. There are a couple of things you can do to your bases. I've found that using Google to look for images of lava helps tremendously. If nothing else, you can copy the colors you see there on your bases. Lava is one of those things that require it to be pretty close for it to look like lava. Otherwise it just looks like paint on your base. It has very specific qualities that people recognize. You could try adding some reflected light from the lava onto the rock surfaces as well. That might give it that final touch and make it look convincing.